For those with a passion for wine or those who simply enjoy a perfectly chilled glass or two, a wine cooler makes a great addition to a home. Not only does a wine cooler provide excellent storage for your collection, but it also keeps your wine at the ideal temperature and ready to drink whenever the desire arises. The Klarstein Bellevin wine cooler combines an elegant aesthetic with superior functionality, making it a great option. But let’s have a closer look at how it functions. The most crucial aspect of a high-performing wine cooler is the ability to keep the refrigerated bottles at precisely the right temperature, but what do you do if you have wines that need to be chilled differently? Then you need a dual zone model to accommodate both types of wine. The Klarstein Bellevin offers the user two separate temperature-controlled zones. The upper zone of the cooler can be programed to store wine from 54°F-65°F, while the lower zone offers temperatures between 46°F-64°F. By having two independent cooling zones, you can provide the correct environment for different collections of wine. One of the best features of this model is that even in extremely hot and humid geographical locations, the desired temperature can be reached and maintained easily. 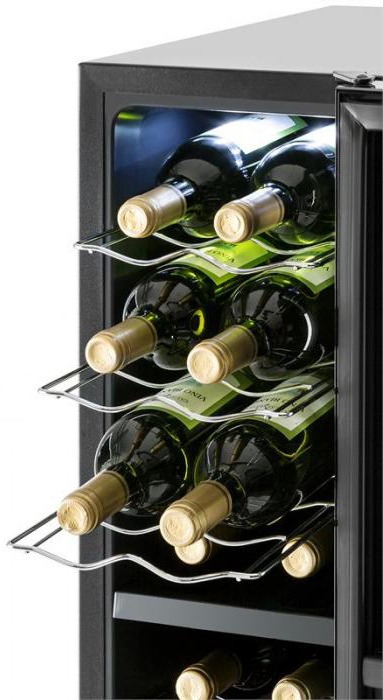 With 1.6 cubic feet of storage space, this cooler is able to store 16 standard sized bottles of wine at once, with eight in each of the upper and lower zones. Six removable metal shelves allow for easy unit cleaning and, on their removal, permit bottles to be stood upright. Despite its storage space, the Klarstein Bellevin is not an overly large or bulky wine cooler. Measuring just over 35.5 inches high and 10 inches wide, this compact appliance is able to fit into small spaces with ease and is roughly counter height. The cooler’s slim fit allows you to maintain valuable space in your kitchen or bar area. But its super slim design doesn’t come without its downside. With a protruding cork in your bottles, the door may not always be able to close properly if the cooler is at full capacity. Removing some of the bottle and laying opened bottles down solves this, but it can be a nuisance depending on the size of the bottles you plan to store in it. 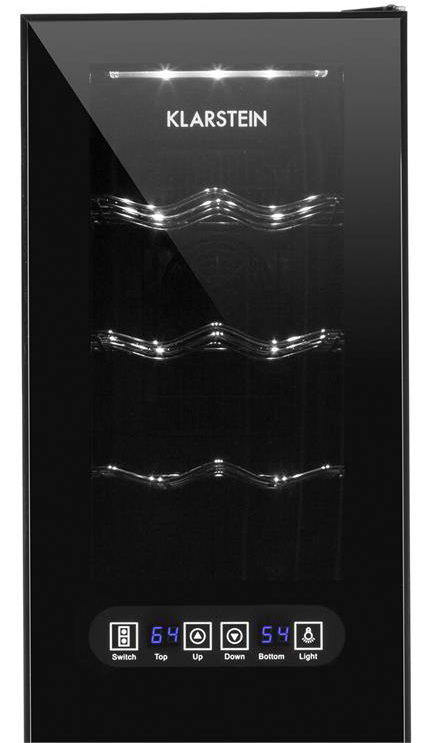 Controlled via an external LCD touchscreen system, the Klarstein Bellevin wine cooler is extremely easy to use. At a single touch, the temperature can be adjusted, and the upper zone’s internal LED lighting can be switched on or off, making the process of checking on your precious collection that much more straightforward. It also has a quick and simple installation. This unit requires no special installing procedures or technical knowhow. It can be used right out of the box. Plugging the cooler in and setting the desired temperature is all it takes to get the Klarstein Bellevin up and running. Stylishly designed, the upper zone of this wine refrigerator features clear glass in the door. This permits the user to easily see inside, examining the bottles without needing to open the door and compromise the temperature stability. The overall look of the Klarstein Bellevin is sleek black with a shiny, gloss-like finish that suits contemporary kitchen décor as well as blending in with upscale bar and restaurant aesthetics. Its design should complement your existing home setup perfectly. When considering a wine cooler to install at home, one important factor to consider is the noise level it is likely to emit. 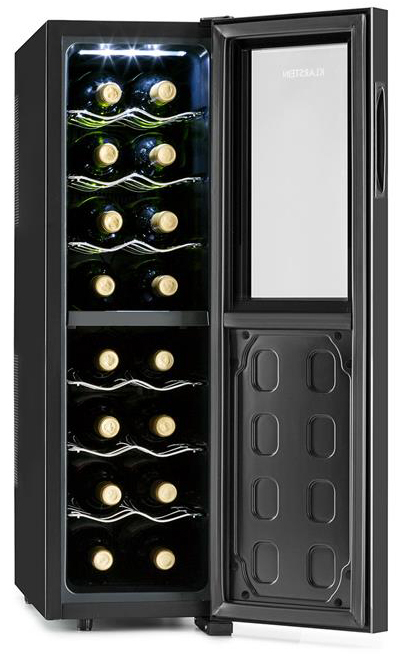 While some coolers hum and buzz almost as much as regular fridges, the Klarstein Bellevin wine refrigerator is exceptionally quiet, with a 38-decibel operating noise. This unit is very quiet; the sound is an almost imperceptible low hum. For energy conscious users, the Klarstein Bellevin boats an impressive energy rating. Designed for optimum efficiency, which also helps to make this unit very quiet, this wine cooler uses only 185 kilowatts per year, making it one of the most energy-efficient wine refrigerators available on the market. Due to the cooling device of the Klarstein Bellevin wine refrigerator, it requires ample airflow for heat venting, and as such is not suitable for installation in recessed alcoves. Overall, this is a tight-fitting, sleek cooler that isn’t perfect but is of very high quality. For opened bottles, you may have to do some rearrangin, but if you are simply storing unopened bottles, this product will be excellent.